The best gift for anyone who loves getting crafty in the kitchen. 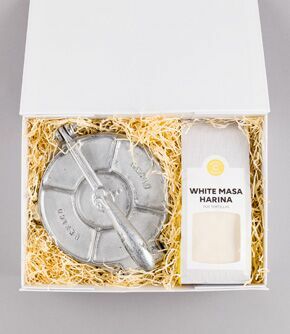 Nothing beats warm homemade tortillas and this kit contains an authentic cast iron press, masa harina and a recipe leaflet to guide you through the process. The press makes beautifully round tortillas of an even thickness. Masa harina is GM and gluten free. 1 Cast Iron Tortilla Press, 1 Masa Harina for Tortillas 500g and recipe sheet. All packed in a smart box (colour may vary from photo) with a red ribbon. The debut book from Mexico’s best chef, Enrique Olvera, pioneer of contemporary, authentic Mexican food and global gourmet influencer.Enrique Olvera is the most famous and celebrated Mexican chef working today. Olvera’s restaurant Pujol was ranked #1 in Mexico and #20 in the world at the World’s 50 Best Restaurant Awards. This is his first book and the first ever high-end chef cookbook in English on Mexican cuisine. It captures and presents a new contemporary Mexican style of food, rooted in tradition but forward thinking in its modern approach. Olvera has pioneered and defined this new way of cooking and belongs to a global group of gourmet influencers that includes Noma’s Rene Redzepi, Dom’s Alex Attala, Osteria Francescana’s Massimo Bottura and elBulli’s legendary Ferran Adria.Olvera rethinks how to use traditional, authentic local ingredients using unusual flavor combinations to create a reinvented way of cooking and eating. Mexico from the Inside out includes both sophisticated and more accessible recipes to explain Enrique's philosophy, vision, and process. He is fueled by a constant exploration of Mexico's ingredients and culinary history, and inspired by his early family memories about food. This book goes beyond stereotypes to reveal new possibilities of Mexican cuisine, which is now an essential part of the international conversation about gastronomy.Features:Over 65 recipes, each with an elegant photograph, from the sophisticated dishes served at Pujol to more accessible casual dishes that he enjoys with his family at home.More than 100 atmospheric photographs capture the vivid mosaic of the Mexican landscape while tip-in pages bring the reader up close to Enrique’s vision and philosophy about food.